RETRO KIMMER'S BLOG: AT THE DIA: PLAY BALL COMMEMORATES 50TH ANNIVERSARY OF 1968 WORLD SERIES! AT THE DIA: PLAY BALL COMMEMORATES 50TH ANNIVERSARY OF 1968 WORLD SERIES! 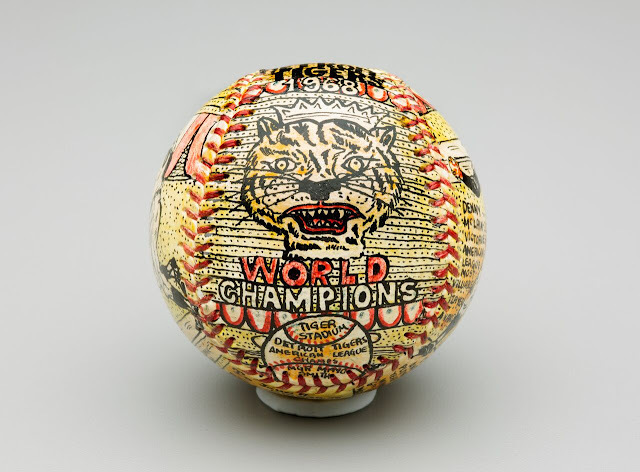 The DIA exhibition commemorates the 50th anniversary of the Detroit Tigers’ 1968 World Series victory with memorabilia, baseball cards and collectibles. If you were a kid then, you won’t believe the feeling of being then again. If you’ve only heard about it, you’ll discover what the time was all about. Take a step back in time and celebrate the great American pastime of baseball at Play Ball! Baseball at the DIA, featuring items from the Michigan-based E. Powell Miller collection and the Detroit Institute of Arts. This exhibition commemorates the 50th anniversary of the Detroit Tigers’ 1968 World Series victory with memorabilia, baseball cards and collectibles. Visitors will also experience the extraordinary opportunity to view more than 500 baseball cards known as the “T206 White Border Set.” Miller’s collection of these vintage cards is noted for its rarity and superlative condition, and includes a Joe Doyle “error card” as well as the coveted and rare Honus Wagner card. Visitors also will experience the extraordinary opportunity to view more than 500 baseball cards known as the “T206 White Border Set.” Miller’s collection of these vintage cards is noted for its rarity and superlative condition, and includes a Joe Doyle “error card” as well as the coveted and rare Honus Wagner card. The exhibition runs through Sunday, Sept. 16 at your Detroit Institute of Arts.